Product prices and availability are accurate as of 2019-04-19 18:01:28 UTC and are subject to change. Any price and availability information displayed on http://www.amazon.com/ at the time of purchase will apply to the purchase of this product. Fun and simple, the Ore International 83" Brushed Steel Arch Floor Lamp will look great in any room of your home. This lamp features a marble round base, brushed nickel finish, and chrome accents. 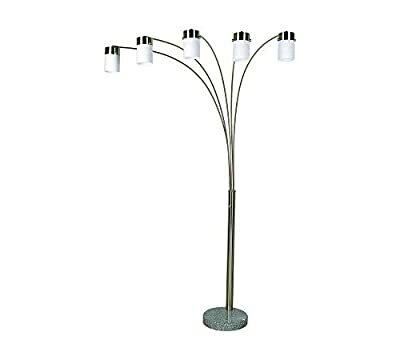 A 5-head floor lamp with white oval shades made of plastic completes the look of this stylish lamp.